An Introduction to the “Holistic Vision” Project about Eye Floaters from the Newsletter written by athor Floco Tausin. The observation of eye floaters reveals dots (or spheres) and strands. The strands are filled with spheres more or less visible. The spheres are perfectly circular and concentric and show a core and a surround. Two contrasting types of spheres can be distinguished : such with bright surrounds and dark core, and such with dark surrounds and bright core. kinds of eye floater spheres. Spheres and strings prove to be very dynamic, not only regarding their mobility but also regarding their size or “state”: the very same sphere may appear big and diffuse or small and focused. The transition of one state to another is fluent and a matter of minutes or even seconds. For the sake of simplicity I distinguish between an initial or relaxed state and a final or concentrated state. Generally it seems as if most eye floaters were, at first, relaxed and thus bigger, nearer, and more transparent. With increasing time of observation, however, they change into a concentrated state. After abandoning the concentration, this latter state of the spheres and strands will change into the state of relaxation again; a quick glance to somewhere else may suffice. 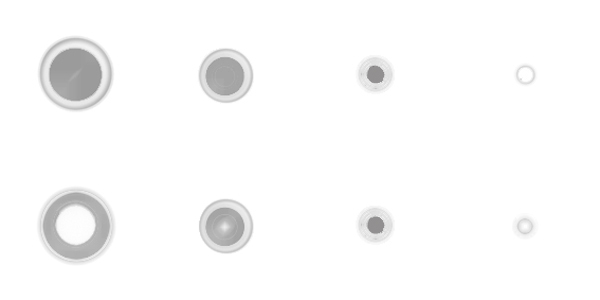 The two kinds of eye floater spheres in transition from the relaxed state (left) to the concentrated state (right). In the state of relaxation, eye floaters seem transparent. With increasing concentration, however, they become brighter. Small concentrated dots or spheres shine very intensively. This effect may be influenced by “outer” factors: brighter lighting conditions as well as greater proximity of the concentration point (e.g. if floaters are seen in an area near the nose tip) favor this illuminating effect; looking at the spheres through the eyelashes or a pinhole in a sheet of paper also makes them seem concentrated. The “inner” factor of one’s ability to concentrate is crucial, too, since the shining state of floaters can be established purely by observation and concentration – and is relatively fast lifted again by diversion. 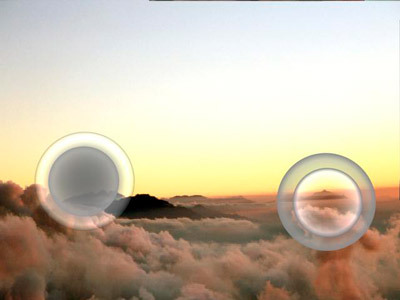 Eye floaters react sensitive to eye movements. It seems as if they would always move in the direction in which we look. But as soon as we keep the eyes still and observe the floaters from the angle of vision, we recognize that they sink – sometimes faster, sometimes slower. With regard to this, proximity plays a role: the bigger and nearer spheres and strands sink faster while the smaller dots in the back move down more slowly. This sinking is not irreversible: a firm look upwards suffices to make disappeared eye floaters reappear in the visual center again.